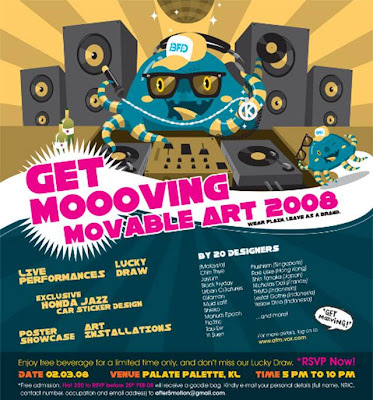 Get mooving movable art 2008 was held at palate pallete KL. It is and art exhibition event whereby around 20 designers will be exhibiting their work and product such as clothing line, shoes and artistic drawings and posters. Me (pupu) , kennyville and erng mei decided to head down to KL and check this event out.. here are some of the cool stuffz we managed to see and experienced! The place is small but not the crowd! more of them being pinn up on the wall as part of their creative design ! check out this toilet door. around 10, the event ended .time to ciowz!